Head lice are everywhere. If you have kids and they are around other kids, they are at risk for getting head lice. They are in every community and school district, from the richest to the poorest. Although the focus of parents and pediatricians is usually on treating head lice infestations, with more lice being resistant or hard to treat, it is probably even more important to teach your kids to avoid head lice. Since head lice can't jump from child to child or crawl into your home, preventing head lice infestations isn't as hard as it may sound. Use these practical tips. Encourage your kids to avoid sharing things that have been on or near another child's head, including hairbrushes, combs, hats, scarves, towels, helmets, pillows, sleeping bags, etc. Teach your kids to hang up their coats and hats on an individual hook, or some other separate area when they get to school, instead of just throwing them in a pile with other classmates' clothing. Regularly clean things that your child's head has direct contact with that they share with other children. Examples are car seats, pillows, and headphones. Check your child for nits and live head lice at least once a week. Although you may find head lice anywhere, they are often found at the back of your child's head, near his neck, and behind his ears. Wash your child's hair with a regular shampoo and hair conditioner. It's easier to comb through your child's hair if you use hair conditioner. Check your child's hair while it is still damp. Recognize the symptoms of head lice, which includes an itchy scalp and small red bumps or sores on the back of your child's neck and scalp. Don't panic, though, if your child must be treated for head lice. Be extra vigilant for head lice if there have been frequent reports of head lice at your child's school or in your child's classroom. Review all of these head lice prevention steps before and after sleepovers, school field trips, or when your child goes camping. You won't prevent head lice by keeping your child's hair short or in a ponytail. Nor will special shampoos, conditioners, or hairspray help. You should avoid using potentially toxic products if your child doesn't have an active infestation. Remove all of the nits on your child's head. Missing some nits is a common way for kids to have a persistent infection, as lice keep hatching and keep the infestation going. Don't hesitate to tell other people, especially the parents of kids with which your child has close contact, that they should likely check their own kids for lice. 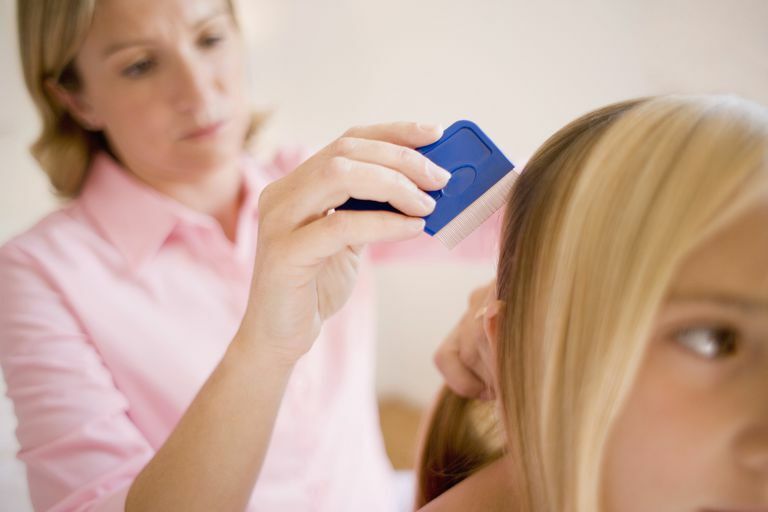 Your child might get lice again, even after being properly treated, if the kids around her aren't also treated. Kids most commonly get head lice through direct head-to-head contact with other children. Watching school-age kids play and interact with each other, you know that can't be eliminated. Concentrate on catching lice infestations early and do what you can to encourage your kids not to share objects that touch their heads. That said, sharing a helmet or other protective gear rather than going without one is not a big risk, and could potentially save your child from having a serious injury.